Total solar eclipse is one of the most fascinating astronomical phenomena. Thousands and sometimes millions of people, as it was in case of the last total eclipse visible in central Europe, travel to the narrow band of totality to enjoy fleeting beauty lasting few minutes only. Even people without any knowledge in physics and astronomy realize during the total eclipse that our Sun is definitely not a boring light source of a round shape shining down from the heaven but an extremely interesting living star which occupies surprisingly large part of the sky. Astonishing series of scientific discoveries were made during the rare total solar eclipses. Probably the most famous one was done on May 29th 1919 when it was proved that the Sun behaves like a giant achromatic gravitational lens as it was predicted by Einstein's general relativity theory. Although nowadays cosmic probes greatly extended the possibilities of observing the Sun as the telescopes can be placed outside the interfering Earth's atmosphere, each total solar eclipse remains a scientific event of great importance. 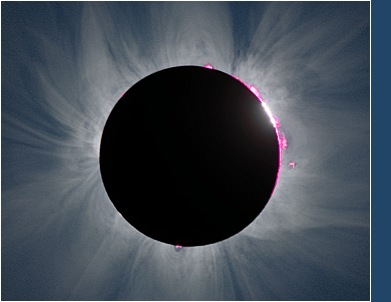 Total solar eclipse gives an unique opportunity to take advantage of digital cameras, advanced photographic films, fast computers, and modern mathematics and create images of inner corona in the quality which is nowadays impossible to be reached by any other way. The main aim of these Web pages is to prove that the previous sentence is truthful and that from the scientific point of view it makes sense to organize expeditions to each total solar eclipse. Other types of eclipses as partial solar eclipses or lunar eclipses are presented on these Web pages too. I would like to illustrate wide possibilities of mathematical image processing or simply to show the beauty of the phenomenon. Total Solar Eclipse 29. 03. 2006 - Libya I. Total Solar Eclipse 29. 03. 2006 - Libya II. Total Solar Eclipse 11. 07. 1991 - Baja California, La Paz I. Total Solar Eclipse 11. 07. 1991 - Baja California, La Paz II. Solar eclipse photography if one of the most difficult tasks of astronomical photography. There are at least three reasons for that. The first and main one is the extreme contrast which makes impossible to record the phenomenon on a single image. Neither classical nor digital photography have the ability to master the brightness ratio which is necessary for successful eclipse photography. The second reason is little chance for making experiments. If anything gets wrong it may take years to get an opportunity for a new experiment. The last but not the least reason is the fact that processing of images taken during total eclipse is very complicated and time consuming work with needs of one purpose software being developed specially for this aim. During the last decades there was large amount of observing material obtained with great afford. This material contains many valuable information on solar corona which has not been fully used yet. Fast computer processors, gigabyte sized memories and high resolution scanners together with newly developed mathematical methods make possible to use archival films for creation of corona images in the quality which was not possible to be reached several years ago when these images were taken. In 2002 the author of these Web pages started the MMV project the aim of which is to develop new mathematical methods to make the processing of corona images more effective, especially the highly precise registration, and to visualize coronal structures by means of adaptive filters which are inspired by human vision. Nowadays, the project has participants all over the world and it is open to any professionals or amateurs who have high quality images of total solar eclipses and would like to participate on this project. The results of MMV project are continuously published in the MMV project archive. The coordinator of the project is Hana Druckmüllerová.